TaxHampton’s mission is to help our clients achieve success by providing personalized attention and a commitment to service that addresses not only today’s needs but tomorrow’s plans. This dedication to helping you achieve your financial goals means placing a premium on timeliness, thoroughness and accuracy. Angela Gray begins accepting small business clients as an accounting consultant. She continues to accumulate new business. Forms dba “AGL Tax & Accounting Services.” In 2007 Angela concentrates on AGL Tax & Accounting Services full-time. Continued growth signals time to incorporate. In 2008 TaxHampton, Inc. is formed. In 2009 The Great Recession hits the Hamptons hard. TaxHampton works with clients through careful tax planning and budgeting to minimize their tax burden. The firm perseveres. 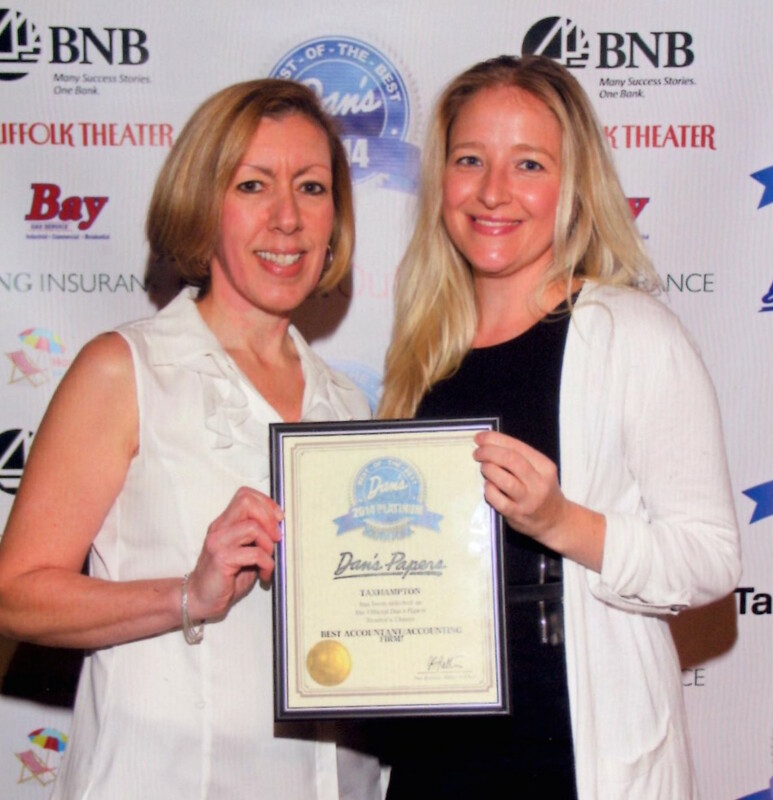 Angela Gray is elected to the Board of the Manorville Chamber of Commerce. Serves two years as Vice President. She is instrumental in organizing the Networking Events for the Chamber. In 2011 TaxHampton joins the Southampton Chamber of Commerce. Agnes Renes Sopolinski joins the firm as a Junior Accountant. Angela Gray sits for and passes the IRS’s Registered Tax Return Preparer Examination. In 2013 TaxHampton wins the Platinum Award for the Best Accounting Firm on the South Fork from Dan’s Papers Best of the Best Contest. TaxHampton is approved by the IRS as an Authorized Acceptance Agent, to facilitate those applicants looking to obtain ITIN’s and EIN’s. For the second year in a row, TaxHampton wins the 2014 Platinum Award for the Best Accounting Firm on the South Fork from Dan’s Papers Best of the Best Contest. 2015 is the most successful tax season ever. Use of new technologies is exploding – online accounting software, accepting credit card payments on mobile devices, use of remote viewing of client’s computer, all enable TaxHampton to work more efficiently and serve its clientele better. Angela provides Payroll, HR, Bookkeeping, Benefits Assistance (liaison with broker), Tax guidance and related work for my start-up company, The Internet Advertising Institute. Without her, I would not have been able to get past the wall of payroll, tax, insurance, benefits and other stuff – none of which is user friendly – that new businesses need. Angela is the consummate professional. I have the honor and privilege to serve with her on the Board and the Marketing Committee of the Manorville Chamber of Commerce. Angela is thoughtful, articulate and extremely organized. She follows through with all obligations and goes above and beyond. I am happy to recommend TaxHampton, Inc and Hamptons Payroll, Inc. Angela is a pleasure to work with and is always available to answer my questions. If she doesn’t know an answer immediately, she always does the research and gets back to me with a thorough and detailed answer. While Angela and I both provide similar tax services, I have come to rely on her payroll expertise, and without hesitation I can recommend my small business clients to her for their payroll reporting needs. Send us a message to set up your free consultation. Sign-up for our monthly email newsletter. Your information is safe and secure.